An experienced civil servant, he suddenly left his job as chief executive of Newham Council last July, to take over from the retiring Douglas Batchelor in the summer. However, the League seems curiously reluctant to publicise this exciting news. A source has told Shooting Times that a statement about Mr Duckworth?s appointment was not made until six days after his appointment was finalised and, even then, it was only because the Independent on Sunday was about to break the story. The Independent on Sunday article suggested money could be at the heart of the matter. Mr Duckworth hit the headlines in a survey of local authority bosses last year, when it was revealed that his annual salary of £241,483 was the second highest in the country for a public sector worker. When asked by the newspaper about Mr Duckworth?s salary at the League, a spokesman said that ?whatever he gets, it will be a significant pay cut and anyway, he cares passionately about the charity?. 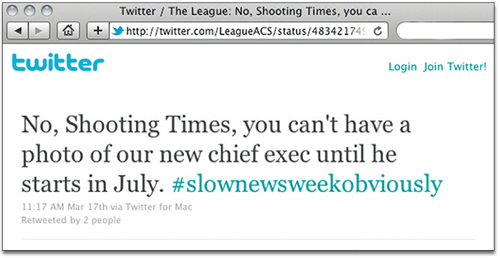 The Independent on Sunday had more luck in getting information from the League than Shooting Times. When ST attempted to obtain a photo of Mr Duckworth to accompany this article, the League refused to help. Shortly after, the League wrote on Twitter: ?No, Shooting Times, you can?t have a photo of our new chief exec until he starts in July?. Our resourceful picture editor, never one to give up easily, found an image of Mr Duckworth from another source. One thing about Mr Duckworth?s appointment is clear. Outlining his plans for the future, the League?s statement quotes Mr Duckworth as saying: ?Securing the future of the Hunting Act will remain a priority but I am also keen that we develop our work to end dog fighting once and for all, and to expose the cruelty of gamebird shooting. ?